^ 1.0 1.1 Beevor 2009, p. 82. ^ 2.0 2.1 2.2 Williams 1988, p. x. ^ 9.0 9.1 Shulman 2007, p. 192. ^ 10.0 10.1 10.2 10.3 Wilmot 1997, p. 434. ^ 12.0 12.1 12.2 Tamelander & Zetterling 2003, p. 341. ^ 13.0 13.1 13.2 Tamelander & Zetterling 2003, p. 342. ^ 14.0 14.1 14.2 Whitmarsh 2009, p. 109. ^ 15.0 15.1 Giangreco，Moore & Polmar 2004, p. 252. ^ 16.0 16.1 Tamelander & Zetterling 2003, pp. 342–343. ^ 17.0 17.1 17.2 17.3 Beevor 2009, p. 519. ^ 18.0 18.1 Flint 2009, pp. 336–337. ^ 27.0 27.1 Ford & Zaloga 2009, p. 11. ^ 35.0 35.1 Wilmot 1997, p. 170. ^ 37.0 37.1 37.2 Ford & Zaloga 2009, p. 14. ^ 39.0 39.1 Whitmarsh 2009, pp. 12–13. ^ Ellis，Allen & Warhurst 2004, pp. 521–533. ^ 43.0 43.1 43.2 43.3 Beevor 2009, p. 3. ^ 46.0 46.1 46.2 Beevor 2009，Map, inside front cover. ^ Ellis，Allen & Warhurst 2004, pp. 78, 81. ^ Goldstein，Dillon & Wenger 1994, p. 6. ^ Whitmarsh 2009，Map, p. 12. ^ 55.0 55.1 Whitmarsh 2009, p. 11. ^ 59.0 59.1 Wilmot 1997, p. 321. ^ 69.0 69.1 Whitmarsh 2009, p. 27. ^ 72.0 72.1 Whitmarsh 2009, p. 34. ^ Goldstein，Dillon & Wenger 1994, pp. 50–51, 54–57. ^ Goldstein，Dillon & Wenger 1994, pp. 59, 61. ^ Goldstein，Dillon & Wenger 1994, pp. 61–62. ^ 81.0 81.1 81.2 81.3 Whitmarsh 2009, p. 30. ^ 84.0 84.1 84.2 Whitmarsh 2009, p. 31. ^ 85.0 85.1 85.2 Whitmarsh 2009, p. 33. ^ Goldstein，Dillon & Wenger 1994, p. 13. ^ Goldstein，Dillon & Wenger 1994, pp. 16–19. ^ 96.0 96.1 96.2 Ford & Zaloga 2009, p. 30. ^ 97.0 97.1 97.2 97.3 Whitmarsh 2009, p. 13. ^ Goldstein，Dillon & Wenger 1994, p. 11. ^ 101.0 101.1 Ford & Zaloga 2009, pp. 54–56. ^ 107.0 107.1 Beevor 2009, p. 74. ^ 116.0 116.1 Hughes 2010, p. 5. ^ 119.0 119.1 Beevor 2009, p. 116. ^ Ford & Zaloga 2009，Map, p. 170. ^ 146.0 146.1 Wilmot 1997, p. 301. ^ Ellis，Allen & Warhurst 2004, pp. 247–254. ^ Beevor 2009，Map, p. 344. ^ 182.0 182.1 Stacey 1960, p. 286. ^ 184.0 184.1 Ford & Zaloga 2009, pp. 341–342. ^ Ellis，Allen & Warhurst 2004, pp. 487–488. ^ Ellis，Allen & Warhurst 2004, pp. 488, 493. ^ 201.0 201.1 Tamelander & Zetterling 2003, p. 343. ^ 208.0 208.1 Beevor 2009, p. 520. ^ 209.0 209.1 209.2 Flint 2009, p. 354. ^ 210.0 210.1 Flint 2009, p. 352. Ambrose, Stephen. 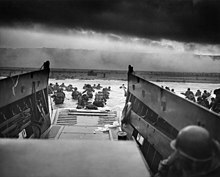 D-Day June 6, 1944: The Climactic Battle of World War II. New York: Simon & Schuster. 1994 . ISBN 978-0-671-67334-5. Army Battle Casualties and Non-Battle Deaths in World War II,: Final Report, 7 December 1941 to 31 December 1946. Washington, DC: Statistical and Accounting Branch, Office of the Adjutant General, Department of the Army. 1953-06-01. OCLC 220594130. Badsey, Stephen. 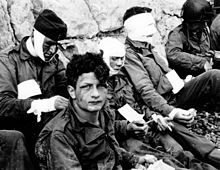 Normandy 1944: Allied Landings and Breakout. Osprey Campaign Series. Botley, Oxfordshire: Osprey Publishing. 1990. ISBN 0-85045-921-4. Beevor, Antony. D-Day: The Battle for Normandy. New York; Toronto: Viking. 2009. ISBN 978-0-670-02119-2. Beevor, Antony. The Second World War. New York: Little, Brown and Company. 2012. ISBN 978-0-316-02374-0. Bickers, Richard Townshend. Air War Normandy. London: Leo Cooper. 1994. ISBN 0-85052-412-1. Bradley, Omar N. A Soldier's Story. New York: Holt. 1951. OCLC 769013111. Brown, Anthony Cave. Bodyguard of Lies: The Extraordinary True Story Behind D-Day. Guilford, CT: Globe Pequot. 2007 . ISBN 978-1-59921-383-5. Buckingham, William F. D-Day: The First 72 Hours. Stroad, Gloucestershire: Tempus. 2004. ISBN 978-0-7524-2842-0. Buckley, John. British Armour in the Normandy Campaign 1944. Abingdon, Oxfordshire: Taylor & Francis. 2006 . ISBN 0-415-40773-7. Churchill, Winston. Their Finest Hour. The Second World War II. Boston; Toronto: Houghton Mifflin. 1949. OCLC 396145. Churchill, Winston. Closing the Ring. The Second World War V. Boston: Houghton Mifflin. 1951 . OCLC 396150. Copp, J. Terry. 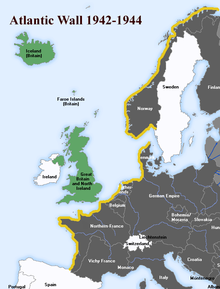 Montgomery's Scientists: Operational Research in Northwest Europe: The Work of No. 2 Operational Research Section with 21 Army Group, June 1944 to July 1945. Waterloo, Ontario: Laurier Centre for Military, Strategic and Disarmament Studies, Wilfrid Laurier University. 2000. ISBN 978-0-9697955-9-9. Copp, J. Terry. Fields of Fire: The Canadians in Normandy. Toronto: University of Toronto Press. 2003. ISBN 0-8020-3730-5. Corta, Henry. Les bérets rouges [The Red Berets]. Paris: Amicale des anciens parachutistes SAS. 1952. OCLC 8226637 （法语）. Corta, Henry. Qui ose gagne [Who dares, wins]. Vincennes, France: Service Historique de l'Armée de Terre. 1997. ISBN 978-2-86323-103-6 （法语）. Dear, I.C.B. ; Foot, M.R.D. (编). The Oxford Companion to World War II. Oxford; New York: Oxford University Press. 2005 . ISBN 978-0-19-280666-6. D'Este, Carlo. 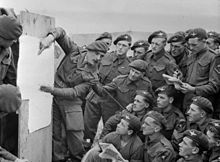 Decision in Normandy: The Real Story of Montgomery and the Allied Campaign. London: Penguin. 2004 . ISBN 0-14-101761-9. OCLC 44772546. Forty, George. Villers Bocage. Battle Zone Normandy. Sutton Publishing. 2004. ISBN 0-7509-3012-8. Ellis, L.F.; Allen, G.R.G. ; Warhurst, A.E. Butler, J.R.M, 编. Victory in the West, Volume I: The Battle of Normandy. History of the Second World War United Kingdom Military Series. London: Naval & Military Press. 2004 . ISBN 1-84574-058-0. Evans, Richard J. The Third Reich At War. New York: Penguin Group. 2008. ISBN 978-0-14-311671-4. Fenton, Ben. The disaster that could have scuppered Overlord. The Telegraph (Telegraph Media Group). 2004-04-26 [2014-02-16]. Flint, Edward R. The development of British civil affairs and its employment in the British Sector of Allied military operations during the Battle of Normandy, June to August 1944 (Ph.D.论文). Cranfield, Bedford: Cranfield University; Cranfield Defence and Security School, Department of Applied Science, Security and Resilience, Security and Resilience Group. 2009. OCLC 757064836. Ford, Ken; Zaloga, Steven J. Overlord: The D-Day Landings. Oxford; New York: Osprey. 2009. ISBN 978-1-84603-424-4. Gaddis, John Lewis. Russia, the Soviet Union, and the United States: An Interpretive History. New York: McGraw-Hill. 1990 . ISBN 978-0-07-557258-9. Giangreco, Dennis; Moore, Kathryn; Polmar, Norman. 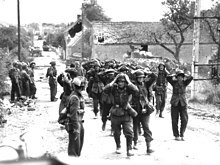 Eyewitness D-Day: Firsthand Accounts from the Landing at Normandy to the Liberation of Paris. New York: Barnes & Noble. 2004. ISBN 978-0-7607-5045-2. Gilbert, Martin. The Second World War: A Complete History. New York: H. Holt. 1989. ISBN 978-0-8050-1788-5. Goldstein, Donald M.; Dillon, Katherine V.; Wenger, J. Michael. 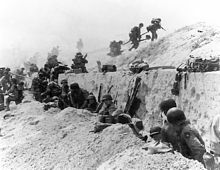 D-Day: The Story and Photographs. McLean, Virginia: Brassey's. 1994. ISBN 0-02-881057-0. Government of Luxembourg. Les Luxembourgeois de la "Brigade Piron" [The Luxembourg "Brigade Piron"]. [2017-03-28] （法语）. Hastings, Max. Overlord: D-Day and the Battle for Normandy. New York: Vintage. 2006 . ISBN 0-307-27571-X. Horn, Bernd. 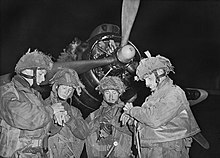 Men of Steel: Canadian Paratroopers in Normandy, 1944. Toronto, CA: Dundurn Press. 2010. ISBN 978-1-55488-708-8. Hughes, Thomas Alexander. Overlord: General Pete Quesada and the Triumph of Tactical A. New York City, NY: Simon and Schuster. 2010. ISBN 1-43911-853-1. Shulman, Milton. Defeat in the West. Whitefish, Montana: Kessinger. 2007 . ISBN 0-548-43948-6. Stacey, C.P. 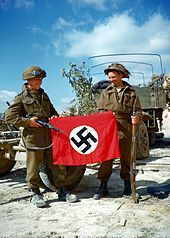 The Canadian Army 1939–45: A Historical Summary. Ottawa: Published by Authority of the Minister of National Defence. 1948. Stacey, C.P. The Victory Campaign, The Operations in North-West Europe 1944–1945 (PDF). Official History of the Canadian Army in the Second World War. Vol. III. Ottawa: Published by Authority of the Minister of National Defence. 1960. Tamelander, Michael; Zetterling, Niklas. 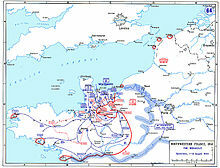 Avgörandets Ögonblick: Invasionen i Normandie [Determining the Decisive Moments: The Invasion of Normandy]. Stockholm: Norstedts. 2003 . ISBN 978-91-1-301204-9 （瑞典语）. US Department of the Navy, Naval History and Heritage Command. 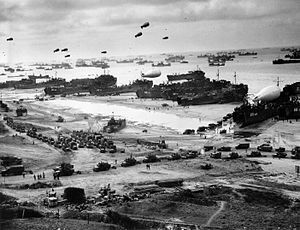 D-Day, the Normandy Invasion, 6 – 25 June 1944. Frequently asked questions. [2017-03-30]. （原始内容存档于2010-11-24）. Weinberg, Gerhard. A World At Arms: A Global History of World War II. Cambridge: Cambridge University Press. 1995 . ISBN 978-0-521-55879-2. Whitmarsh, Andrew. D-Day in Photographs. Stroud: History Press. 2009. ISBN 978-0-7524-5095-7. Williams, Jeffery. The Long Left Flank: The Hard Fought Way to the Reich, 1944–1945. Toronto: Stoddart. 1988. ISBN 0-7737-2194-0. Wilmot, Chester. The Struggle For Europe. Ware, Hertfordshire: Wordsworth Editions. 1997 . ISBN 1-85326-677-9. Zaloga, Steven J. 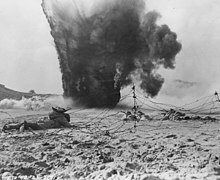 The Devil's Garden: Rommel's Desperate Defense of Omaha Beach on D-Day. Harrisburg, PA: Stackpole Books. 2013. ISBN 0-8117-1228-1. Zaloga, Steven J. Armored Champion: The Top Tanks of World War II. Mechanicsburg, PA: Stackpole Books. 2015. ISBN 978-0-8117-6113-0. Zetterling, Niklas. Normandy 1944: German Military Organisation, Combat Power and Organizational Effectiveness. Winnipeg: J.J. Fedorowicz. 2000. ISBN 0-921991-56-8. Zuehlke, Mark. 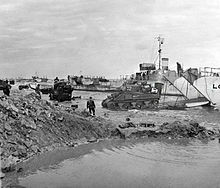 Juno Beach: Canada's D-Day Victory: June 6, 1944. Vancouver: Douglas & McIntyre. 2004. ISBN 1-55365-050-6. Ambrose, Stephen E. The Supreme Commander: The War Years of General Dwight D. Eisenhower. Garden City, New York: Doubleday. 1969. OCLC 660826327. Foot, M. R. D. SOE: An Outline History of the Special Operations Executive 1940–1946. London: BBC Publications. 1984. ISBN 978-0-563-20193-9. Keegan, John. Six Armies in Normandy. New York: Penguin Books. 1982. ISBN 978-0-14-005293-0. Montgomery, Bernard. Normandy to the Baltic. London: Hutchinson. 1946. OCLC 637320842. Neillands, Robin. The Battle of Normandy, 1944. London: Cassell. 2002. ISBN 978-0-304-35837-3. Pogue, Forrest C. Chapter XIV: The Pursuit Stops Short of the Rhine. United States Army in World War II: European Theater of Operations: The Supreme Command. Washington, D.C.: Office of the Chief of Military History, Department of the Army. 1954. LCCN 53-61717. Ryan, Cornelius. The Longest Day: June 6, 1944. New York: Simon & Schuster. 1959. OCLC 1175409. Whitlock, Flint. The Fighting First: The Untold Story of The Big Red One on D-Day. Boulder: Westview. 2004. ISBN 978-0-8133-4218-4. Zaloga, Steven. Operation Cobra 1944: Breakout from Normandy. Osprey Campaign Series #88. Oxford: Osprey. 2001. ISBN 978-1-84176-296-8. Ambrose, Stephen. D-Day: June 6, 1944: The Climactic Battle of World War II. Booknotes. C-SPAN. 1994-06-05. （原始内容 (Video of interview)存档于2016年9月7日）. Churchill, Winston. Dieu Protege (sic) la France (Transcript of speech). London: The Churchill Society. 1940-10-21. Leighton, Richard M. Overlord Versus the Mediterranean at the Cairo-Tehran Conferences. (编) Greenfield, Kent Roberts. Command Decisions. Washington: 美国陆军军事史中心. 2000 . CMH Pub 70-7. World War II: D-Day, The Invasion of Normandy. 德怀特·艾森豪威尔总统图书馆. Operations:D-Day and the Normandy Campaign. Democracy: Canadian Newspapers and the Second World War. 加拿大战争博物馆. 2003-09-19.